As I write this, I’m strolling at around 2 mph. Yep, it’s the ultimate in multi-tasking—working AND working out. I’ve long been curious about this treadmill desk trend, so when an opportunity arose to try one for myself, I couldn’t resist. 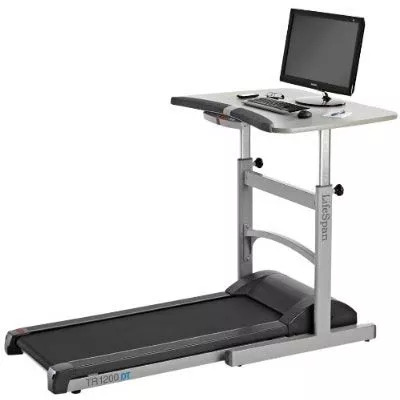 The LifeSpan TR1200-DT Treadmill Desk impressed me right away. It's smooth and quiet, which is a good thing, given the proximity of my office neighbors. It’s also very sturdy—the wide, flat desk (room for a computer, files, phone, printer, heck, even a plant or two) doesn’t wobble an iota, even when grabbed and given a good shake. What’s more, the height is adjustable, and there’s a foam wrist rest that runs along the front. The treadmill itself is plenty wide and long (this was not created for a small space, mind you). The console is simple: start, stop, and speed controls, plus a mode button to show time, steps, calories burned, and distance. In other words, no fancy hill or interval programs here—this machine means, well, business. It’s for sweating over work deadlines, not sweating through a workout tee. It does take some getting used to. My first time WWT (walking while typing), I was only able to go about 1.2 mph. But I adapted quickly; the next time, my WWT speed increased to 1.8 mph, then 2 mph—you get the picture. It’s a terrific way to sneak fitness into your day—and help fight back against the burgeoning obesity trend caused in part by all the sitting we do. One part of my job is to skim other magazines to keep an eye on what Health’s competitors are up to, so earlier this week I hopped on the treadmill to do some browsing; 20 minutes later I had walked about 2000 steps…almost without noticing it. So cool! I do have two small quibbles: If you pause the treadmill for more than a few seconds, it switches the speed back to super-slow. Also, there’s no volume control, so the beeping that accompanies any button press is loud enough to potentially annoy those office neighbors I mentioned. But those are, as I say, quibbles. Overall, the LifeSpan Treadmill Desk is an exceptional realization of an ingenious idea. And while I wouldn’t want it to be my only desk—sometimes I need stillness to concentrate, and yes, even a fitness editor likes to sit down every now and again—it’ll be a sad day when the LifeSpan guy arrives to reclaim my new friend. Pros: This is an excellent, truly convenient way to get more exercise—no extra workout time required. The unit itself is well-built, super-sturdy, and very simple to use. Plus, the price seems quite fair. Cons: You can’t pause for long without losing your speed setting. and it beeps too loudly when any button is pressed. Extra tip: Step off to do anything requiring neat handwriting.